UPDATE for 2010: There’s now a tour fee of $10.50 for everyone age 13 and higher, and now more tours. Well worth it! Want a guided tour of, arguably, the country’s most famous farm? Well, it’s yours for the asking, and for free if you plan way ahead. 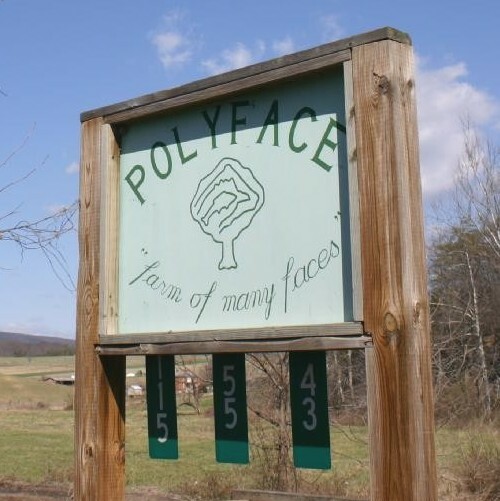 Many folks have heard of Polyface Farm, run by the Salatin family. Patriarch Joel has become a broc star (get it? though, OK, it’s not a produce farm) after being one of the featured farms in Michael Pollan in “The Omnivore’s Dilemma,” a critique of industrial farming. Polyface will be known even further and wider with the release next month of the documentary “Food, Inc,” which paints Joel, once again, as a prophet among demons. 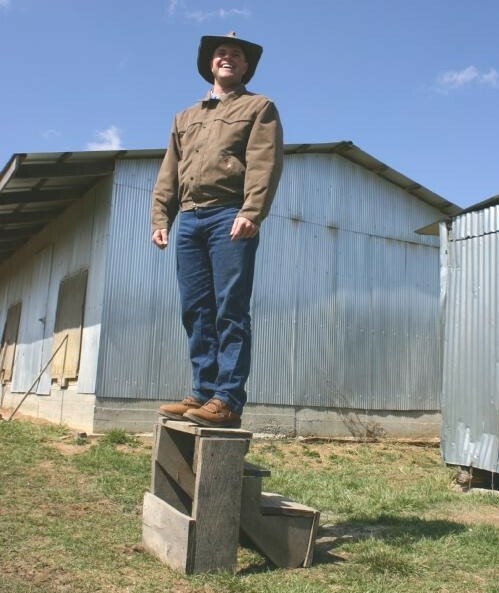 While I’d read much about Joel and Polyface, only when I went deep into the farm’s website did I see that, along with fee-based tours, they give monthly freebies. Also, visitors are welcome to the farm any day but Sunday to do a free self-guided tour. 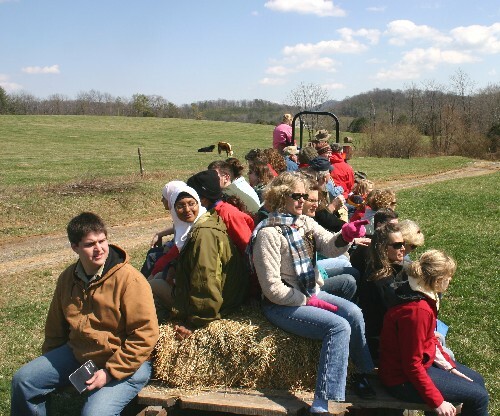 But that’s not half as fun as being escorted by a Salatin and sharing the experience with 80 or so other devotees, including other farmers, groups of college students, and just regular curious folks like us. I thought the tour would make a great story, and was lucky enough to snag a Washington Post assignment. I made reservations months in advance. 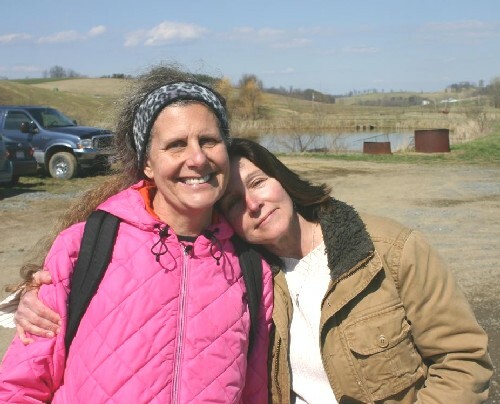 We were joined by my childhood friend Cindy Quick Wilson, who lives near Roanoke. That was a very awesome addition to the day. I used to stay on her family’s farm as a young ‘un. Well, here’s the bad news. After my article was published, on May 6, the free tours for the rest of 2009 filled up. Sorry folks! But if you make a note and in January sign up for a 2010 tour, you’re in! Our tour, the first of the season, on March 20, was led by Joel’s son, Daniel, who was totally engaging and almost as animated as his father is. Joel usually leads these tours himself, but he was off on one of his many speaking engagements. We went from the open-bottom broiler cages to the pig-aerators (exciting! ), then to see grass-fed cows in pasture, and, finally, to the brooder (chicken nursery), teeming with 3,000 adorable day-old peeping chicks. In three weeks, these broilers would be out in the fields. Five weeks later, they’d be ready for slaughter. Let us not forget where we are. If you want to read the Post story, it’s here. Tour sign-up and area travel info is here. If you’re itching to see a farm photo slideshow by my wonderful photographer and partner Wessel Kok, that’s here (along with a few Staunton photos and what-not). And if you want to tell us about other great farm tours, please do so! If they’re in North Carolina, I’ll consider them for my upcoming guidebook, Farm Fresh North Carolina. Keep our farms alive! Tags: Daniel Salatin, farm tours, Food Inc., Joel Salatin, Michael Pollan, Omnivore's Dilemma, Polyface Farm, Staunton, Va. This entry was posted on May 20, 2009 at 8:35 am and is filed under Environmental, Farms, Food, Virginia. You can follow any responses to this entry through the RSS 2.0 feed. You can leave a response, or trackback from your own site. Thanks for the information, your article was fantastic and I am very excited to see the movie now, I didn’t even know about it. I actually used to live in Durham, as we had our own little family farm near Penny’s Bend close to Durham Regional Hospital and we just left one year ago to move to Krakow, Poland (my wife is Polish). I have created a small alliance of like-minded folks around sustainable agriculture and we are hoping to replicate much of what has happened in the Piedmont area here in Krakow over time, as we are just a few steps behind industrial agriculture here in Poland and if we don’t create awareness, could easily fall into the same trap as we have in the US. If you do any more articles in this vein, I would love stay abreast of them, as I am always looking for good ideas.